I wake up at 4:15AM, just after the ship sails under Lion’s Gate Bridge. I get my dSLR out and take some photos of the bridge, Stanley Park, and the downtown, all lit at night. 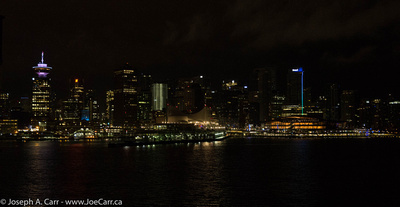 I capture some excellent photos, especially as the ship turns and docks at Canada Place. Since it is 5AM, there is no coffee available anywhere on board. I go up to the Explorations Cafe on the off chance they are open at 6:30AM (their usual opening time), but no luck! My continental breakfast arrives right on time at 7:30AM in my cabin, so I have a cup of tea, a scone and pastry, yogurt, and cranberry juice. I pack my last minute items and get ready for departure, double and triple checking the closets, drawers and bathroom to ensure I don’t forget anything. My friends call me at 8AM saying they are ready to disembark. Although it is a bit early for our time slot, I am ready to go as well, so we meet in the hallway outside their cabin. The passengers who have Expedited Departures are ahead of us, and they are still clogging the elevators, but we manage to get to the gangway deck and scan our ship security cards for the last time and leave the ship. Canada Customs and Immigration are waiting for us in the passageways to the main cruise ship terminal. They take our forms and wave us through, not even wanting to see our passports – welcome to Canada! We are in the terminal an hour early, but find the waiting area for the bus to Victoria. Unfortunately, there are no chairs to sit on, so we stand, waiting in line until the two buses board everyone. We are on our way at 9:15AM, right on schedule, and our bus goes straight to the Tsawwassen ferry terminal. We are one of several buses on the 11AM sailing aboard the Coastal Celebration ferry, so it is a crush to get up the stairs. However, once we enter the Seawest Lounge, we leave the mayhem behind for serenity and quiet. The Seawest Lounge has a choice of two Starbuck’s roasts of brewed coffee, so I finally enjoy some good coffee and a bit of quiet time. I go back for some snacks: sliced cheese and muffins, and a second cup of coffee, so I’m finally ready to greet the day properly! As usual, the onboard Internet service offered by BC Ferries is totally swamped, so I use my own cellular LTE hotspot to catch up with online happenings as we sail to Swartz Bay. 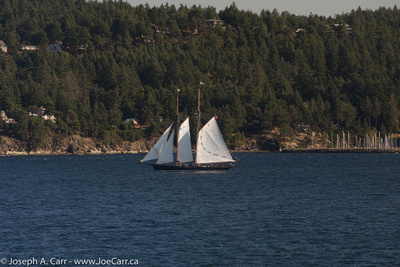 There is a two-masted schooner sailing along the Pender Island coastline – very pretty on such a gorgeous day. Once the bus rolls off the ferry, it makes several stops along the way to drop people off. I am dropped off a few blocks away from where I live, and since it’s a nice day, I roll my bags to home. This entry was posted in British Columbia, Canada and tagged bus, cruise ship, ferry, ship. Bookmark the permalink.